Evidence of illness enhances case for life. 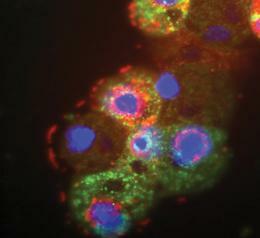 The discovery of a giant virus that falls ill through infection by another virus<sup>1</sup> is fuelling the debate about whether viruses are alive. Giant viruses have been captivating virologists since 2003, when a team led by Claverie and Didier Raoult at CNRS UMR, also in Marseilles, reported the discovery of the first monster<sup>2</sup>. The virus had been isolated more than a decade earlier in amoebae from a cooling tower in Bradford, UK, but was initially mistaken for a bacterium because of its size, and was relegated to the freezer. Now Raoult, Koonin and their colleagues report the isolation of a new strain of giant virus from a cooling tower in Paris, which they have named mamavirus because it seemed slightly larger than mimivirus. Their electron microscopy studies also revealed a second, small virus closely associated with mamavirus that has earned the name Sputnik, after the first man-made satellite. With just 21 genes, Sputnik is tiny compared with its mama — but insidious. When the giant mamavirus infects an amoeba, it uses its large array of genes to build a ‘viral factory’, a hub where new viral particles are made. Sputnik infects this viral factory and seems to hijack its machinery in order to replicate. The team found that cells co-infected with Sputnik produce fewer and often deformed mamavirus particles, making the virus less infective. This suggests that Sputnik is effectively a viral parasite that sickens its host — seemingly the first such example. Sputnik’s genome reveals further insight into its biology. Although 13 of its genes show little similarity to any other known genes, three are closely related to mimivirus and mamavirus genes, perhaps cannibalized by the tiny virus as it packaged up particles sometime in its history. This suggests that the satellite virus could perform horizontal gene transfer between viruses — paralleling the way that bacteriophages ferry genes between bacteria. The findings may have global implications, according to some virologists. 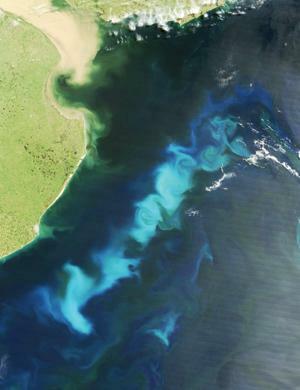 A metagenomic study of ocean water<sup>4</sup> has revealed an abundance of genetic sequences closely related to giant viruses, leading to a suspicion that they are a common parasite of plankton. These viruses had been missed for many years, Claverie says, because the filters used to remove bacteria screened out giant viruses as well. Raoult’s team also found genes related to Sputnik’s in an ocean-sampling data set, so this could be the first of a new, common family of viruses. “It suggests there are other representatives of this viral family out there in the environment,” Koonin says. By regulating the growth and death of plankton, giant viruses — and satellite viruses such as Sputnik — could be having major effects on ocean nutrient cycles and climate. “These viruses could be major players in global systems,” says Curtis Suttle, an expert in marine viruses at the University of British Columbia in Vancouver. <!-- . -->La Scola, B. et al. Nature doi:10.1038/nature07218 (2008). <!-- . -->Raoult, D. et al. Science 306, 1344–1350 (2004). I always felt that viruses are living. what I want to highlight too, is that it took time to understand that Mimi virus was a virus ..
At first, researchers thought they had to deal with a strange bacterium, because Mimi is a very big virus which contains proteins and which infects amoeba. One day, by looking at ME, they saw that Mimi had an virus envelope. It has not been found before, because it was visible with eyes, on the surface of sea..and everybody knows that a microscope is needed to see a bacterium..
what we see and find,depends on our prejudices. It has not been found before, because it was visible with eyes, on the surface of sea.."
After a half century of microbial experiments we are now prone for everything. An open mind in the field of sciences of life is clearly needed to people works in the media. Since more organism are already known to be a sort of intermediate stage between a whole-cell-enveloped organism (eucharyotes), for examples the mycoplasmas and rickettsias (prochariotes). Between prochariotes and acellulates (virus) there is enough space for new discoveries. you express better than me, what I think... (grrr .. ) ! open mind , open eyes, and no prejudices..
Don't take the elephants joke as a prejudice. After a whole bunch of organisms naturaly created and living at deep ocean volcano sites on diferent presumptions than we above, all is possible naturaly. But, all is possible unnaturaly also. Burton:I'm going to try a 2 micron filter. gs., you forgot the "Big Grin" after your sentence. your joke is not prejudice. which produce about half the oxygen on the planet. Like amoebae, C. roenbergensis harbor many microorganisms simultaneously, making them "a good place to exchange genes," Raoult said. "When you live in a phagocytic protist, such as this one, you meet a number of microorganisms, and then you can exchange genes and get a bigger genome." Indeed, of the 500 protein-coding genes Suttle and his colleagues found when they sequenced the virus's genome, about half were similar to those in eukaryotes, bacteria, archaea, and other giant viruses. Those with known function included genes that code for translation factors, DNA repair enzymes, ubiquitin pathway components, and tRNAs. Marine viruses play a critical role in the ecosystem of the world’s oceans but have been largely ignored because most of them do not have a direct economic impact on fisheries or other important industries. Nevertheless, marine viruses are significant mortality agents of marine microorganisms and control their abundance and diversity. Cafeteria roenbergensis virus (CroV) is the first well-studied virus infecting a marine phagotrophic flagellate. CroV replicates inside the single-celled zooplankter Cafeteria roenbergensis, which is widespread throughout the world’s oceans.Its genome size is about 730 kbp, making it the second largest viral genome known. Sequence analysis shows that CroV is related to Mimivirus, the world’s largest virus. Initial cryo-EM images of CroV show that CroV has an approximate size of 3,000Å from one vertex to the other. Unlike Mimivirus (approximately 5,000Å in diameter without fiber), CroV does not contain long fibers on its surface but does share a similar hexagonal profile and a multiple layer internal structure.